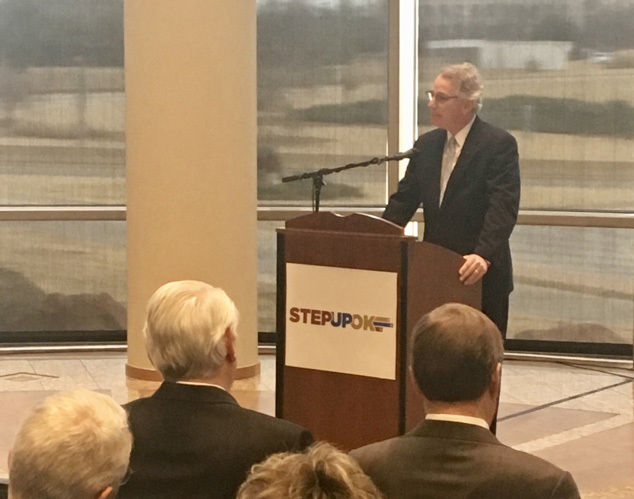 BancFirst Executive Chairman David Rainbolt introduces the Step Up Oklahoma plan at a news conference Friday at the Oklahoma History Center. A broad-based coalition of Oklahoma business and civic leaders are the latest group to offer a specific plan to end the state’s ongoing budget impasse. The proposal is sweeping and dramatic, and is backed by some of the most prominent and powerful industry interests in the state. Whether it will fly with legislators and citizens remains to be seen. Step Up Oklahoma unveiled a package of tax increases and changes in laws intended to improve state governance at a news conference Thursday at the Oklahoma History Center. The proposal would boost funding for core services and give teachers an across-the-board $5,000 pay increase. It would raise cigarette and motor fuel taxes, the individual income tax and the gross oil and gas production tax. Wind generation would be taxed for the first time. A big change would be lowering the minimum percentage vote in the Legislature required to approve tax increases, from 75 percent to 60 percent. The proposal also would extend legislative term limits to 16 years, from the current 12, and allow the governor to appoint the heads of the largest state agencies. Details have yet to be disclosed on many revenue measures, but Step Up Oklahoma leaders released a wide-ranging list of business, tribal and civic supporters. The plan drew criticism from some in the wind industry, who felt they had been excluded from planning as the package was being developed. Step Up Oklahoma representatives later invited The Wind Coalition to participate. Anti-tax groups, such as the Oklahoma chapter of Americans for Prosperity, also came out in opposition. The state’s two largest oil and gas associations, the Oklahoma Independent Petroleum Association and the Oklahoma Oil and Gas Association, did not take a position until their boards weighed in. On Tuesday, the two groups announced their support for Step Up’s efforts. Meanwhile, two representatives of Step Up, David Rainbolt and Glenn Coffee, discussed the plan Friday with Oklahoma Watch. 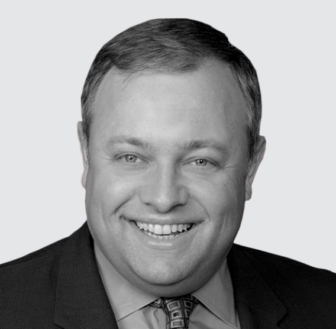 Rainbolt is executive chairman of BancFirst, which has 100 banking locations across Oklahoma. 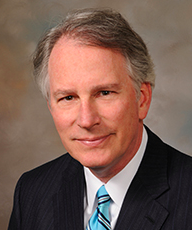 Coffee, a private attorney, is a former president pro tempore of the Oklahoma Senate. This interview has been edited and condensed. Q: How did you become involved in this effort? Rainbolt: It started with the governor’s office to raise a trial balloon about going to the “Texas plan,” where we tax services and create a broader tax base to give teachers a raise. Clearly, that was way too early in the process and there was just zero interest in the services tax, probably because it just affected so many industries. It was just a non-starter. That was probably my first effort, and I’m surprised it wasn’t my last effort given how unsuccessful it was. It just evolved over time. Then you’ve got the “A-plus” plan (from the first special session). We were out lobbying in favor of that, but that process probably demonstrated to all of us that … we in business were part of the problem. We were lobbying both sides of that issue and the Legislature was in the middle of it. Q: We heard rumblings in mid-December that a new plan was being discussed by business leaders. Is that when things kicked into high gear? Rainbolt: I’d say it was much more gradual … I think it began as a series of meetings between people, and then people realized others were talking and it began to get more formalized. Heck, there were Oklahomans talking about this stuff. We’re no different. Q: How did you come to be the one who presented the proposal? Rainbolt: Probably because I’m an independent. I’m neither fish nor fowl. (At BancFirst) I’m in both the metro and non-metro areas of Oklahoma. I’m not in oil and gas or the wind industry, which are obviously in a death match. Q: The oil and gas associations, and a few other energy companies, aren’t yet among the supporters. Why? Q: Many of the revenue proposals have been offered before and weren’t approved. Why do you think your group will have more traction? Rainbolt: It’s an all-in-one package. We’ve got a multiplicity of revenue ideas in which every individual component has been voted down. But you’ve got uses of funds that are probably the least controversial among the parties. Then you’ve got the (governing) reforms that will entice those who will be a tougher vote on revenues. Yes, it’s tied to revenues, but only if there will be some controls, and only if the revenues are spent on this small group of things that everyone believes is worth investing in. And the other thing is sequence. Everything had a sequence before: ‘We’ll do this but not until you do that.’ Well, by putting it all together, we avoid that problem. Q: Have you received any assurances from State Capitol leaders that they will take this up as a package? Coffee: We don’t have any firm commitment other than we’ve had very positive conversations to work together in good faith to solve the problems. We’ve been told it’s on us to go work the votes, which we’re doing. All of the leaders have acknowledged that a solution needs to be developed. While they’re not announcing the plan with us, they’ve been part of the conversation the whole time. Q: What are you doing to follow up? Will there be advertising or public education campaigns? Rainbolt: There is hardly time to educate the public. We assume the public is fed up and it won’t take much to spark their interest. We’ve got to work with the Legislature, both houses, both parties, and the executive branch. If they decide they still don’t want to do this – despite the fact that it brings in elements that all sides dislike and all sides like – then it’s not going to happen. Q: Your members and supporters are broad-based and contribute to campaigns. Will they take a carrot-and-stick approach with contributions to win acceptance? Rainbolt: Not in our group. That’s not come up. I think at this juncture, we’re just trying to be positive and accretive to the process that takes place in the Legislature. To get a bill introduced is the number one thing we must do. It’s just putting one foot in front of the other. Q: None of the revenue proposals would directly affect the banking industry. As a banker, can you explain why no new taxes on banking are included? Rainbolt: I tried to do that six months ago with the tax on services. Now, it wasn’t just banking, but it was banking and real estate and a little bit of sales tax on services in a whole bunch of industries. So, I tried. I put banking on the table first and taxes on services, but it was a bridge too far. It got nowhere. There’s nothing revolutionary in the package now. Introducing new things at this juncture, especially ones that were losers like taxes on services, really weren’t part of it. We had to deal with components that were still strewn around the battlefield. Q: The wind industry has been vocal, saying they were not at the table and should have been more involved. It looks like $15 million in revenue would come from wind. How was that amount calculated? Coffee: There’s been so much attention on wind, but out of an $800 million package, it’s $15 million, or under 2 percent. It’s meant to be comparable to the load that’s being placed on other energy sources. It’s not like we’re singling out one industry. Q: Why is it important to tie revenue with other changes that your group describes as government “reforms”? Coffee: These reforms are weighty and tackle some of the most difficult structural challenges we have in state government. From lowering the supermajority threshold to budget stabilization to creating an independent budget office to rooting out waste and fraud. We cannot have increased revenue absent reforms and expect to turn Oklahoma around.